It's time again to talk seriously about burgers. 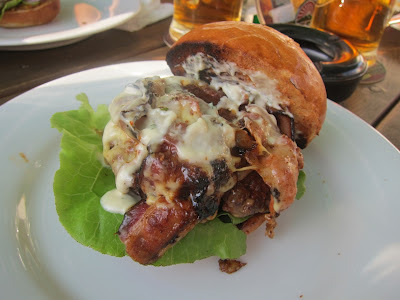 My annual roundup of Prague's burgers is before you. 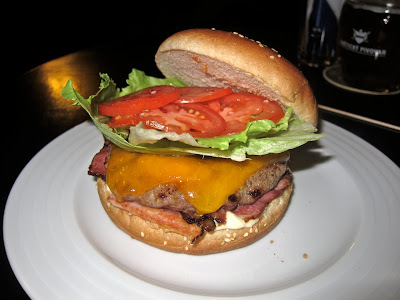 In 2008, I first started writing about all the burgers I had throughout the course of the year. 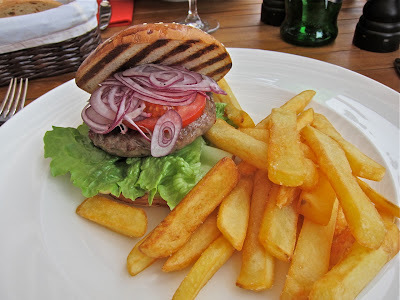 With the 2011 list, even I was taken aback by all the burger love in the Czech Republic. The opinions and recommendations just kept on rolling. I'd dare say that 2012 has been a great year. Many of Prague's purveyors of grilled ground beef patties on buns are stepping up their game. Restaurants are grinding their own beef, fiddling with the fat content, using great grills, and custom-ordering their buns. 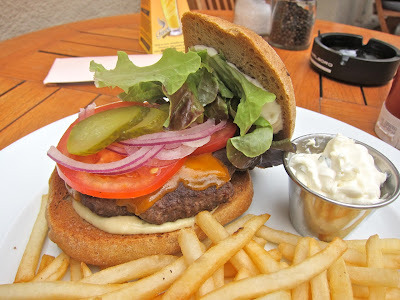 I've had some burgers here that actually rival what I tasted recently at LT Burger, a top spot in New York City. Sadly, I've also had a few burgers that momentarily made me regret this wonderfully unhealthy obsession of mine. 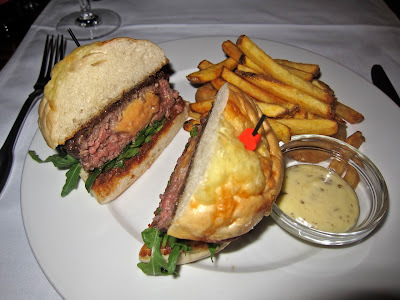 As always, I will repeat my standard disclaimer: This is not a list of the "best" burgers. It is a purely subjective survey of the ones I either liked or disliked the most, based on my personal taste. What's my taste? I prefer flame-grilled beef seasoned with salt, perhaps pepper, and classic, American-style construction and toppings. I tend to look down on excessively creative reinterpretations of time-honored standards. 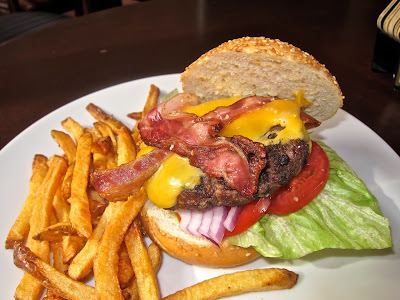 I did my best, whenever possible, to compare bacon cheeseburgers or to keep the comparisons as similar as possible. I do not consider price as a main factor, but it does influence my thinking to a small degree. The burgers below are a record of what I had and when I had them. If the burgers got better, worse, or changed significantly the week after I was there, that's too bad. The Katr Burger (199 CZK) is served on a dense, toasted, ciabatta-like roll. It comes with mustard, chive mayo, lettuce, tomato, pickle and red onion. Fries are included. The meat was terribly dry, dense, and difficult to chew. The cardboard-like texture was unpleasant. I asked for it to be prepared medium, but it was cooked all the way through. I could only eat half of it and gave up due to fatigue. This was the worst burger patty I've had since I began keeping records. 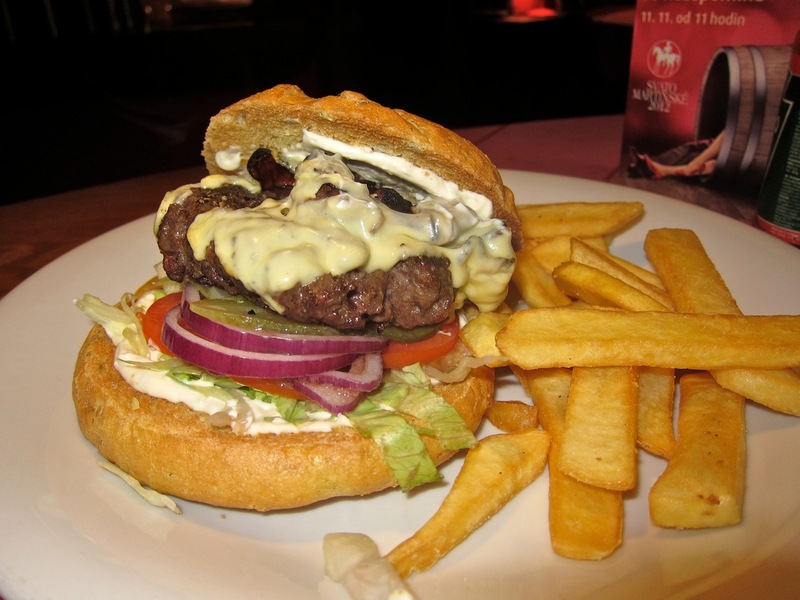 In 2011, the Fraktal Burger (185 CZK) came in fifth place. Oh, how the mighty have fallen! I had it just a couple of weeks ago, and it went very wrong. The ground beef is the most important part of any burger, and this one had three significant pieces of gristle or sinew that were quite unpleasant to chew on. And chew on. The patty was way too salty. They have a wonderful flame grill at this restaurant that adds a lot of flavor. It would take a lot to screw up something grilled on it. They managed it. They even grilled the pre-cooked bacon to heat it up. I watched as it caught fire. I thought perhaps they had discovered a new method for cooking bacon. In fact, they discovered a way to give it the consistency of rope. It was harder to chew than the gristle. They also introduced a new "cornbread" bun. It was a little stale, and way too big for the 150 gram patty. There was a lot of it left at the end. I could go on, but I'll stop here. The name isn't the only strange thing about this place. 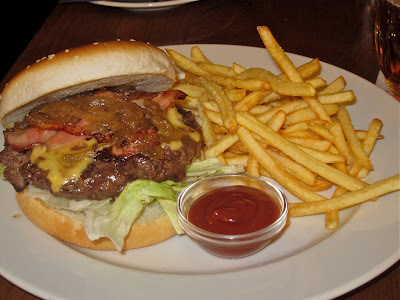 The ground beef in the "Cheese-bacon burger" (149 CZK) had a strong, odd flavor. The meat was heavily seasoned and had a tang to it. It was a seasoning I've tasted before, but I could not put my finger on what it was. The burger would have been quite good without this extra flavor. I liked the bacon. The cheese was dull, processed stuff. The fries that came with it were very good. It comes with a topping or sauce of your choice. If I can give you one piece of good advice, avoid the "guacamole" under all circumstances. This concoction had a strange, mealy texture and tasted nothing like any avocado I've ever experienced. It was truly horrible. This place has its fans, but I just say no. 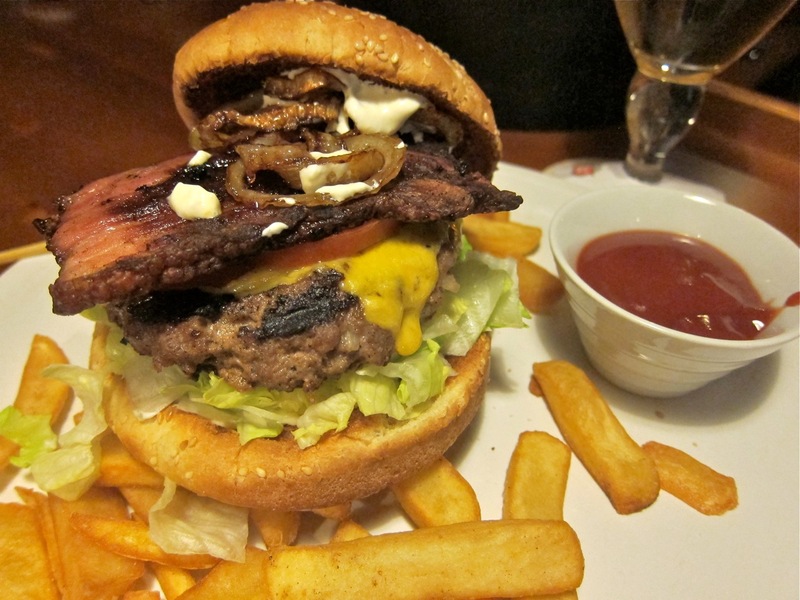 The bacon cheeseburger (70 CZK) was small. The patty was thin, overcooked, and tough. There was a miniscule amount of soft bacon. The cheddar was good. It came with lettuce, tomato, onion, pickle, and too much ketchup. Fries cost extra. Frankly, I'd much rather have a small burger at Burger King for 20 CZK. You would think a restaurant that grills some of the best steaks you'll find in this country would make a top-notch burger. You'd be wrong. Things started poorly when the waiter told me it was not possible to cook the 150 gram patty to medium. I disagreed. 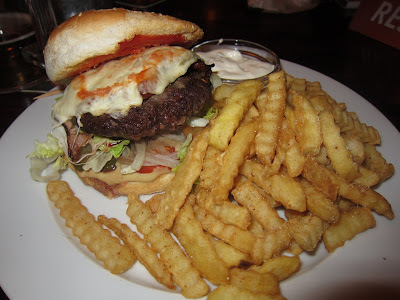 The manager came and told me the El Asador Burger (285 CZK) was too thin and could only be cooked well done. Okaaaay. What came out was terribly bland. The patty and bun had grill marks but really no flavor from the grill. The meat needed salt. On the first bite, juices literally streamed out the back. But the grind was too fine, making it too dense. It did not come with bacon or cheese. There was a ton of mayo underneath, but no ketchup was included. There was an extra charge for a small dish of ketchup and it was cheap Czech stuff. I hate that. I believe Heinz is the only ketchup that should be served with burgers. Several people highly recommended the Royal Cheeseburger (169 CZK) to me at the start of the year. It came with fried onion, garlic mayo, Red Leicester cheese, pickles, and barbecue sauce. The big problem I have is that I don't really consider it a burger. The patty is more like a meatloaf than a burger patty. I wouldn't say it comes with bacon. It is more like a slab of pork belly. It actually tastes OK for what it is. But it was pretty frustrating because it was large, unwieldy, and completely fell apart. I like this hidden little restaurant in Vršovice, mostly for its style. It has a retro-vibe and real character. 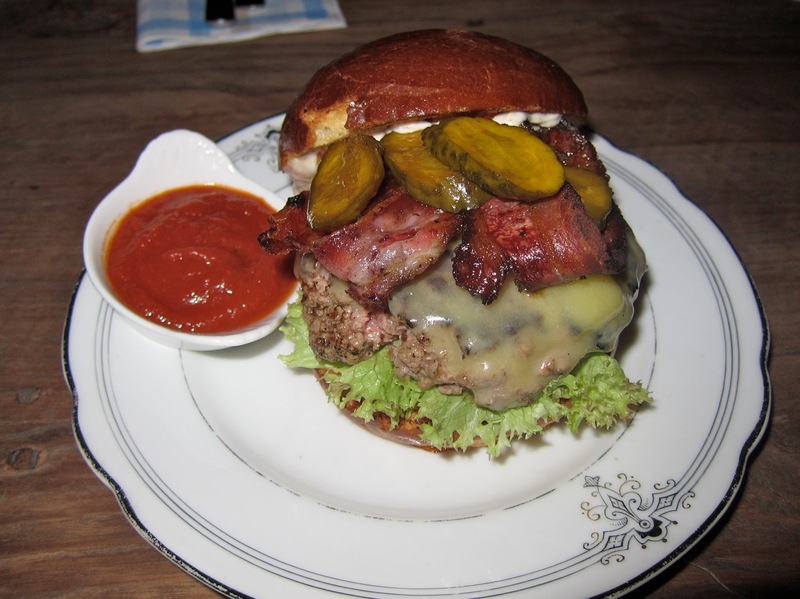 The True Blue Burger with bacon and cheddar (149 CZK) looks OK. It was made with a hefty 200 grams of ground beef. Unfortunately, it was brought low by a tough, chewy patty. The tiny dish of ketchup wasn't nearly enough for both the burger and the included fries. The grilled onions were a nice touch. 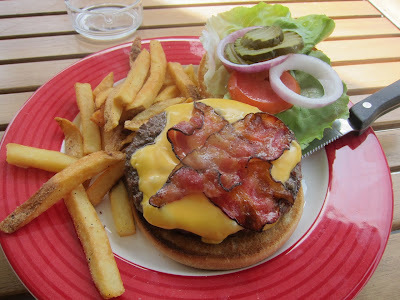 I first ate this bacon cheddar burger (195 CZK) in January. It was also the last one I ate. I had no interest in trying it again. The menu said "200 grams ground beef burger." This is not right. There was pork in there. There's a school of thought that says beef/pork mixes are OK. I say it's not OK. I'm a 100% ground beef person. Just add salt. Whether it was the pork or a lower quality of beef or overgrinding, the texture of the patty was too dense and rubbery. On the plus side, the toasted bun was crispy, light, and sturdy. The bacon was perfectly cooked, smoky, and ranks with the best I've had in Prague. The cheddar was nicely melted and top quality. Fries are not included. Whatever you think of this burger, it doesn't matter. The restaurant has become a very popular nightspot, with people attracted by the bright, retro-American diner look. Or the attractive ladies perched on the stools after the lights are turned low in the evenings. I hadn't had this burger for a long time. It used to be pretty good, but not great. The one I had at the beginning of the year was not good. The biggest problem? The overseasoned, rubbery, gristled ground beef. They cooked it well done, which I am against. The bacon was soft and very ham-like. The cheese was bland. The lettuce, tomato, and onion were underneath the patty, so they absorb its heat. This is a peeve of mine. I think these items should be on top or on the side to keep them from getting hot and mushy. Fries were included, but they were barely warm. The one nice thing I can say: it came on a good, toasted bun. Every year, I include an offering from Burger King. This is my version of a "scientific control" of sorts. This limited edition, flame-broiled XXL Bacon Double Cheeseburger was enjoyable in its own limited way. Sure, the American cheese was too processed, but the bacon was better than usual. That charred beef flavor stays on your palate for a long time (sometimes too long). The point of including this burger is this: if I like a BK burger more than yours, be ashamed. Be very ashamed. The Burger Royal goes against all my conservative burger instincts. Served on a brioche-like custom-made bun, the ground beef is wrapped around foie gras and topped with sun-dried tomato, sweet onion compote, and rucola. The high-quality had a delectable smoky char around the outside. The patty was cooked medium rare. The creamy goose center was enjoyable, but I'd like the burger more without it. The two onion rings were greasy, but OK. The truffle mayo on the side for the fries took some getting used to. Miss P often expresses distaste for both burgers and my obsession with them. Neither of us could believe she actually liked this burger. I will add a caveat. I ate this at the beginning of the year. Two people I know and trust told me they tried it recently and found it bland and boring. I can't say how it is now. I just know mine was good. Many will be shocked that this near legendary restaurant about 40 kilometers from the center of Prague is not ranked near the top. These people did not eat what I ate. I went three times last year. The first burger was pretty good. The last two were both drastically overcooked. The menu says all burgers are cooked medium unless otherwise requested. The waiter confirmed that to me, but then it came out well done. And these were cooked both before and after the restaurant changed one American chef for another. 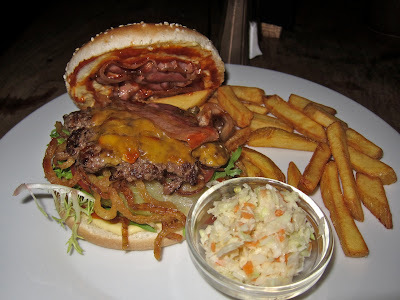 Both I and a Czech friend had trouble finishing the Chupacabre Burger (130 CZK). Our jaws seriously got tired. To overcook that big, round 200 gram patty takes some doing. That said, just about everything else was delicious. The brioche-style buns are the best. The bacon, though too soft, was deliciously smoky. The ancho chili sauce was super nice and crazy spicy. If my burgers were cooked properly, they would leap toward the top. 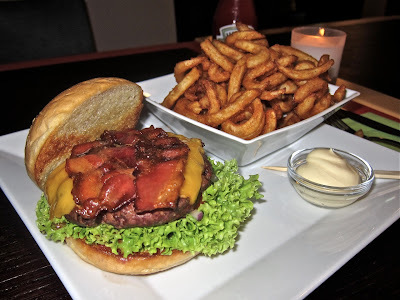 I was very impressed with the Baconburger (160 CZK) the first time I had it this year. I tried it again a few weeks ago and was a little less excited. The 160 gram patty was peppery and tender, but the texture was a little too loose. I asked for it to be cooked medium, but it was not. I liked that the lettuce and tomato were on top. The cheese had nice cheddar flavor. The smoky, crunchy bacon was on the bottom, along with too much mayo. The BK style bun couldn't handle the moisture and didn't hold together at the very end. It's a pretty-good home-style effort. Fries were not included. Yes, it's a chain, but it is American and they do know how to do pretty good standardized burgers. 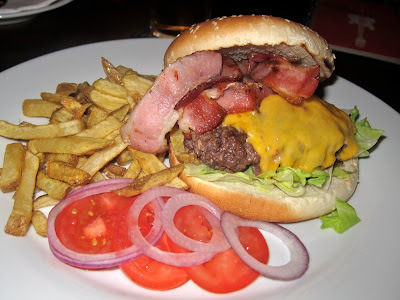 I had their bacon cheeseburger (249 CZK). A little tip here is that the burger at the Anděl location is 50 CZK cheaper than the more central locations in town. This one was reasonably thick, with my favorite flame-grilled flavor. They get extra points for having the toppings on the side. The perfectly round patty was a little too tightly packed and chewy. They went heavy on the salt. The crispy bacon was good but thin. There was too much bland, liquified cheese. I asked for it medium, but it came well done. It comes with a basic bun, but it fits the patty perfectly and held together all the way through. The Legendary 10 oz. Burger (335 CZK) was a past winner. It really hit the flame-grilled spot when it first came to town. Why doesn't it win every year? My tastes have changed. Now I look for burgers prepared with more loving, less corporate hands. This offering is a lot like TGI Friday's, but it is a pumped up version. The brioche-style bun carried its heft. The bacon was amazing, both crisp and tender. The cheddar was the real deal. They also get kudos for having the lettuce, pickles, and tomato on the side. The beef's grind was a little too fine. The patty was juicy but dense. I asked for it medium, but it came well done. I wish they made a smaller version. This burger is too massive for me to enjoy very often. The included fries were good. If the price bothers you, you better not order a Coke. It was 70 CZK. Now THAT will give you a heart attack. The cheddar burger with bacon (215 CZK) came in first last year. Many agreed. Many didn't. The main reason it did so well was simple: great ground beef with a good, rough grind. I ordered it cooked medium and it came out medium. That was again true this year. This one had soft, thick, smoky bacon. So why did it drop this year? Partly it is because of tough competition, but it is also due to some other issues. The cheese was not as good as I remembered. The meat was oversalted. The thing that bothered me the most was the Whopper-style bun. The first time I picked it up, my thumb went right through the bottom. The whole thing fell apart shortly afterward and turned into an unholy mess. In this day of great, bespoke buns, that kind of bread doesn't cut it at the top. The included fries were limp. A serious foodie recommended I try the Supabuga 500 (189 CZK). I loved the flavor of the flame-grilled patty. The ground beef itself was not the highest quality, but still enjoyable. It was topped with nice, crispy, smoky bacon. I liked the sliced pickle. The cheddar was very melted but tasty. It lost points for greasy fried onion strings. Ketchup was pre-applied. I didn't really need the honey mustard sauce. The bun was weak. I wanted ketchup for my fries, which were few but good. The plastic packet of Heinz cost me 15 CZK. Is it fair to review a restaurant's burger the first day they open for business? Not really, but this small, fine-looking place opened right before my deadline. 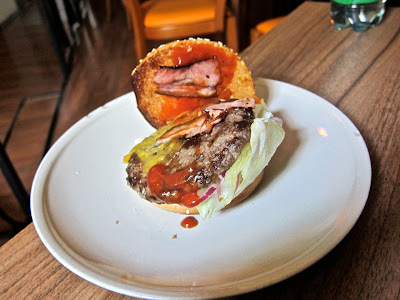 This Dish Burger (179 CZK) has serious potential. The bun was a beautiful thing. The bacon was crispy and crunchy. The beef has the perfect grind, giving it a tender consistency, and they didn't overcook the patty. I loved the special pickles. What needs improvement? First of all, there were small three pieces of unchewable gristle in my thick patty. I was not happy about that at all. It looks like they grind their own meat, and they need to step up the quality. I saw them salting it on their fancy new griddle, but the meat tasted bland. I asked for it cooked medium, and it actually came out rare. There was too much garlic aioli for my taste. I'm not a fan of their homemade ketchup. It tasted like lightly sweet tomato sauce. The burger is relatively small for the price, and fries are not included. I could only get to this restaurant during the day, so they would only do the lunch special burger (169 CZK), which does not include bacon. This was not the most American of burgers, but still excellent in its own right. The custom-baked bun has a crunchy, floury exterior and a lovely, soft interior. It was toasted and mayo with mustard seed was spread inside. Also in there were lettuce, tomato, and terrific grilled onions and mushrooms. The quality of the ground beef was really good. The salt level was just right, with perhaps a touch too much pepper. It was juicy and messy and comes with fries. Although it didn't fit my standard burger parameters, it is the exception that proves the rule. I really enjoyed it. The Bohemia burger with bacon and cheese (165 CZK) has been up and down over the years. This year it's up. The patty had a perfect char from the flame grill. The exterior flavor was the best, and that makes it a top choice for me, despite its faults. I asked for it medium, but no such luck. The crispy bacon was good. The salty cheese didn't have much flavor. Together, the cheese and bacon made up for the lack of salt on the beef. The custom-baked bun was sturdy and held together as always. But it was also somewhat stale and chewy. The homemade fries that come with it were crispier than they used to be, but still not crispy enough. 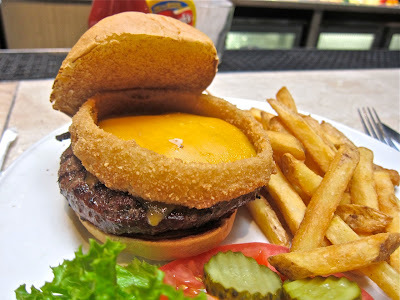 The burgers at this relatively new American-run joint have a big following, and I count myself as a dedicated follower. 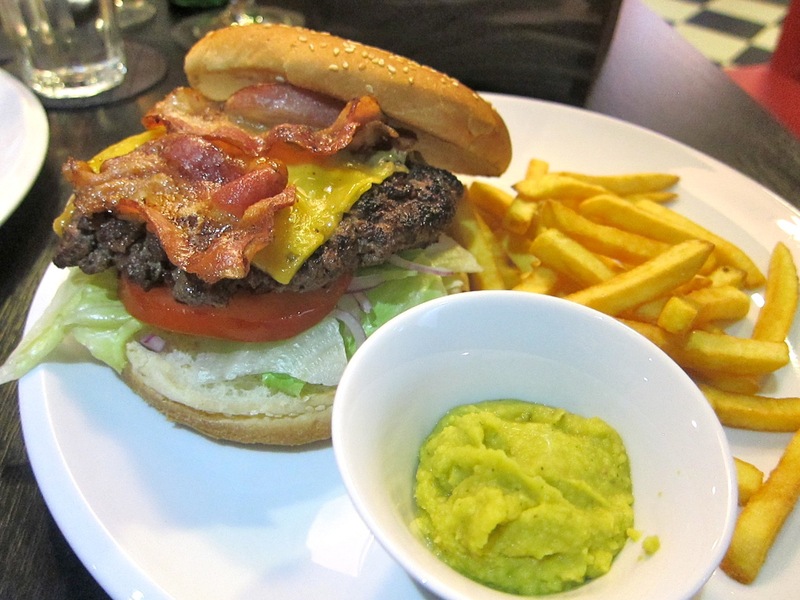 Although I love many things from their burger-centric menu, the bacon cheeseburger (185 CZK) is among my favorites. This burger is the closest thing to America's burger cult favorite, In-N-Out Burger. I was there last year in California. The Tavern's burgers are actually better than what is essentially a top-end fast food experience. The Tavern's custom-made buns are soft, yet strong. 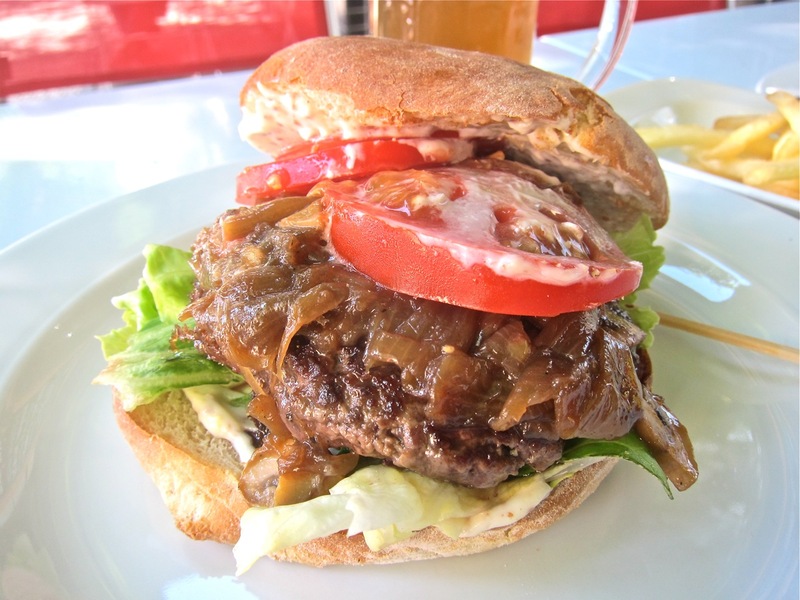 The patty has just the right amount of salt and a tender, yet substantial consistency. Although they say it is topped with pancetta, it's a close cousin of the lightly crisp yet still pliant and smoky American-style bacon I crave. It also has English cheddar, ketchup, mustard, mayo, pickles, and onion. I gave minor demerits for putting the cold toppings on the bottom and too many sauces smeared on the bun. 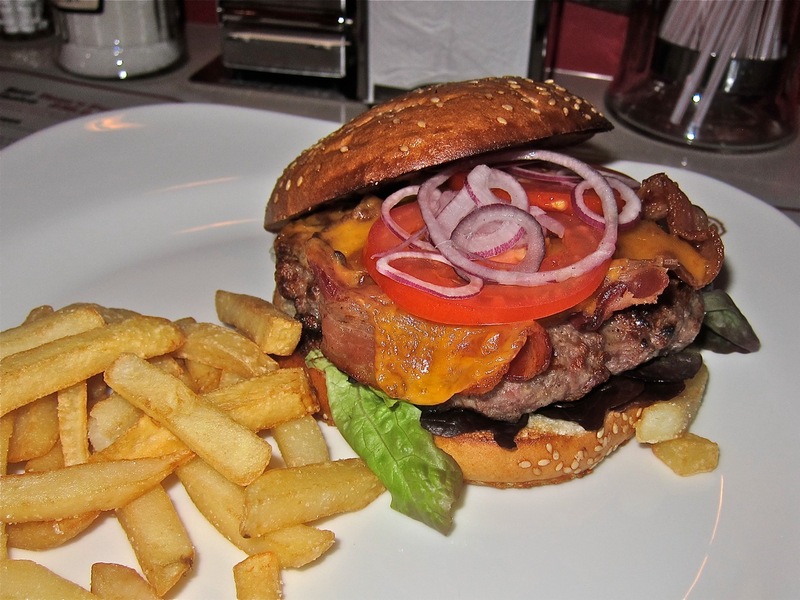 The Mood Classic Burger (225 CZK) is a newcomer on the scene. But it comes from the kitchen of a veteran American chef. 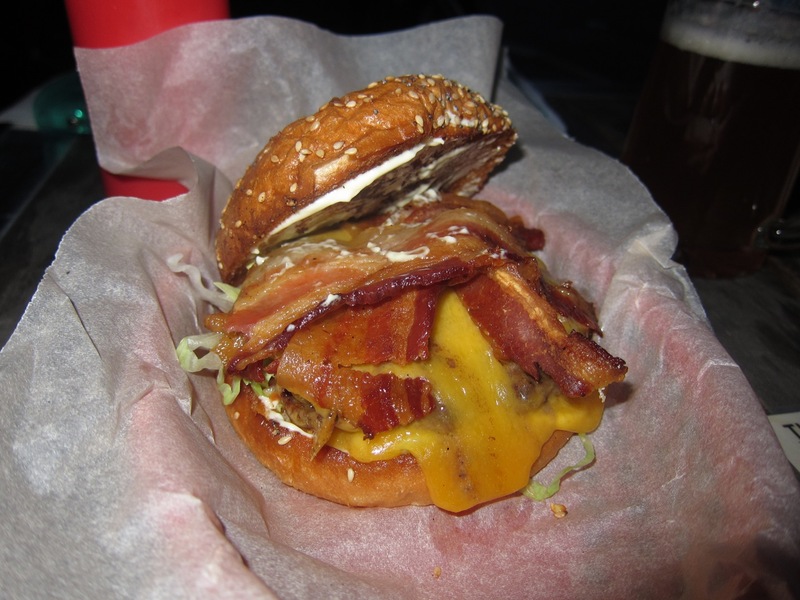 It includes sublime smoked cheddar, but they will add bacon for no extra charge. The top quality ground beef patty from a custom grind was hefty, wonderfully smoky from a lava grill, and just juicy enough. I asked for it medium and it was cooked medium. The beef makes or breaks a burger, and this patty's quality and cooking made it a star. It sits on top of lettuce, tomato, and mayo. As always, I wish those were not underneath. They now supply bottles of Heinz ketchup with their burgers and fries. The cheese was covered with perfectly crispy bacon. I was told the bun is custom-baked for Mood but a top Prague bakery. I love the crunchy curly fries that come with it. This burger is not cheap, but I think it is worth it. I surveyed six friends who have tried both Mood and The Tavern and the vote was 4-2 in favor of Mood (including my vote). It was close, even in my own mind. I didn't include The Tavern's Blue Smoke Burger instead of the bacon cheeseburger, but that was one of the best things I've eaten all year, anywhere. So that's my list. If you disagree, feel free to make your own. I'd seriously love to see it, especially if it has great burgers I have yet to try. I'm always looking for a new winner. Hi Brewsta, thanks for your reviews, I just missing Bejzment. Have you been there? I decided not to go to Bejzment because of the positive reviews posted about the burgers there. Oh yeah, and because they were posted by the Bejzment chef without saying he worked there. Not cool. 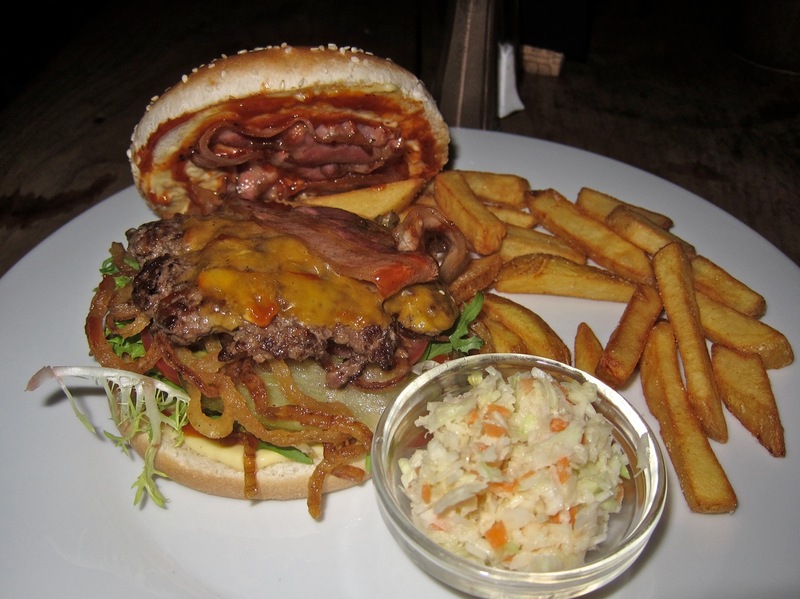 I had the burger with bacon and cheese at Palanda some days ago - and they must have changed the recipe, chef og probably both, as it was very good and didn't look anything like the one you tasted. The patty was good quality beef, cooked medium, the fries were home made and the dressing looked completely different from the one in your picture. I was very happy with everything on my plate!